Leyte is a province in the Visayas region of the Philippines, and is comprised of 2 major cities, namely, Tacloban City and Ormoc City. It is very famous for the largest naval battle in history, which paved the way for the Americans to re-conquer the Philippines from the hands of the Japanese in World War II. #1 - Lake Danao National Park (Ormoc): Located 18 kilometers northeast of Ormoc City, Lake Danao National Park is such a soothing place to relax while having lunch on a floating cottage, with your loved ones. Moreover, with a high altitude of 2,130 feet above sea level – which is the same level with Tagaytay City, Lake Danao, thus, provides a cooler temperature than the average one in the Philippines. This wonderful lake is therefore suitable for a refreshing swim, in addition to a fun canoe ride or kayaking. #2 - San Juanico Bridge (Tacloban): San Juanico Bridge, the longest bridge in the Philippines, with a length of 2.16 kilometers –connects two provinces, which are Samar and Leyte. Joggers, nature lovers and photography enthusiasts, would especially love a visit there either at dawn or dusk, where they can catch a fantastic view of the sunrise and sunset. More so, one can enjoy the feel of the fresh sea breeze and thrill of getting atop its highest peak, to gaze at the beautiful whirlpools, islets, passing boats, etc. #3 - Leyte Landing Memorial (Palo): Also known as MacArthur Landing Memorial National Park, Leyte Landing Memorial Park is an important historical landmark in the Philippines, for it is where the landing of General Douglas MacArthur took place, in Leyte Gulf. This memorable event gave way to the Philippines’ freedom from its Japanese conquerors in 1944. We can remember through this war memorial, the biggest naval battle in the world, in which Japan lost, after almost 3 years of battle. You can visit Palo, Leyte Island, in Eastern Visayas if you’d like to see this very significant piece of the nation’s epic past. 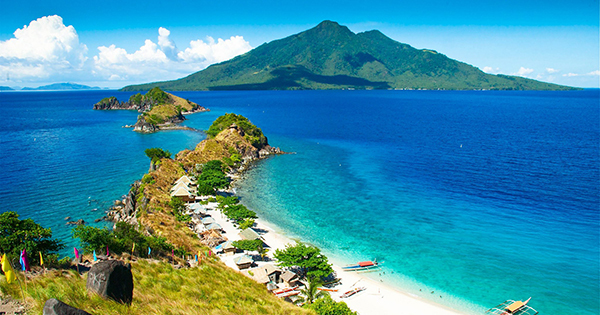 #4 - Sambawan Island (Biliran): A truly captivating find in the province of Biliran, is no less than, Sambawan Island! Almost as beautiful as Boracay Island, you will truly admire its clear turquoise water, exciting sea sports, white sand; not to mention, a meaningful trek to Sambawan Hill’s summit, where you can savor a panoramic view of the entire island. Furthermore, this outstanding beach was miraculously spared from the devastation of two major typhoons, namely, Yolanda and Ruby – that is why, many beach-goers continue to make it their fun and restful getaway. Just prepare your own food, water and tents should you be raring to hit this beach soon, in order to beat the heat. #5 - Calanggaman Island: Shaped like an ant, Calanggaman Island boasts of its very white powdery sand, cool and crystal clear water, and amazing stretch of sand bar. It is not the typical resort though complete with all the amenities like the ones in Boracay, El Nido or Panglao. Tourists to Calanggaman Island should do it like how contestants in the reality show, Survivor, would. Have your tents, food, water and other provisions ready, if you are thinking of staying there overnight. Otherwise, you can just spend a long day there, and bask in the warm sunshine, stroll, jog, swim, dive, snorkel, and take lots of fun photos to strut your stuff. This breathtaking island is definitely worth your time, especially if you are coming from another divers’ haven, that is, Malapascua Island in Cebu.